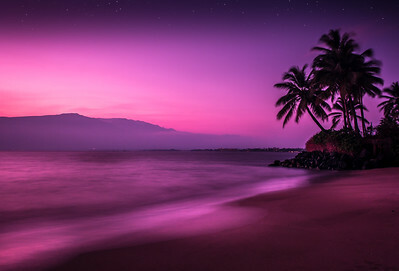 A Hawaiian Twlight, once you see it you will never forget it. 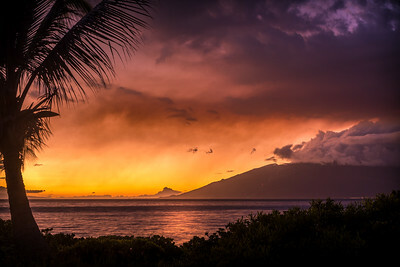 The morning did not start out well for me as clouds and scattered misty, foggy rain showers settled in along the Maui Coast. I began packing up my equipment the strangest thing happened. 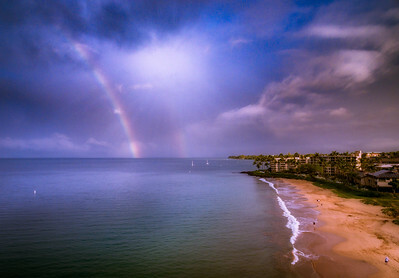 Suddenly the blue sky appeared as the sky opened and 2 rainbows formed in front of me. 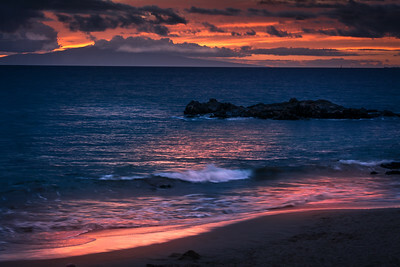 This photograph was taken on a beach in south Kihei (Maui) at approximately 30 minutes past sunset when the sun is well below the horizon on 20th of August 2016. 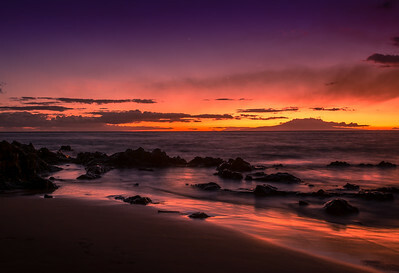 With the atmosphere, clean and clear two planets, Mars and Saturn seen below are performing in the August Maui sky at twilight between (August 17–22, 2016). It had dawned on me later when viewing all my images in post that these specific stars or planets are seen clearly and appeared each night as a triangle moving to line up vertically on the 23rd and 24th of the month. Source Sky & Telescope. These planets are Mars which is the bright orange star and to the right of Saturn top of the triangle, both planets to the left of where the sun appeared are left of the volcanic island of Kahoolawe background. The Antares star appears twinkling to the left of Saturn and Mars forming the triangle. 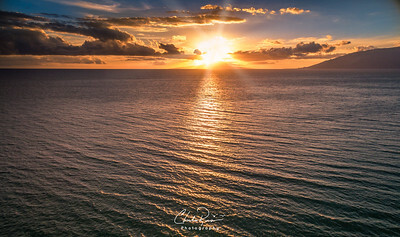 It's approaching dusk as the sun sets at both Kamaole Beach III foreground, and Keawakapu Beach background. On this day, the dark gray storm clouds formed the perfect contrast against the golden yellow sky. 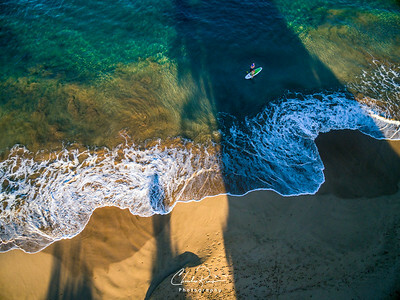 This long exposure reveals the Pacific Ocean's gentle movement against the beach. In The Middle of Nowhere Hawaii - "Sometimes you find yourself in the middle of nowhere, and sometimes in the middle of nowhere you find yourself." 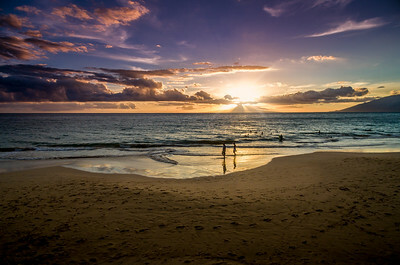 Kalepolepo Beach is one of my favorites. The waves are calmer and it is almost remote. You can catch beautiful sunsets here as well. 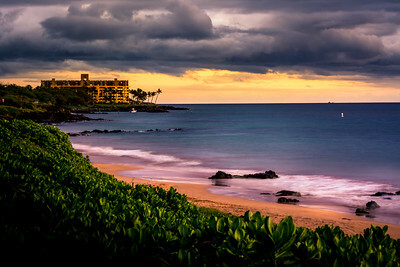 This beach used to be reserved for only Hawaiian royalty. There is a reason for that. 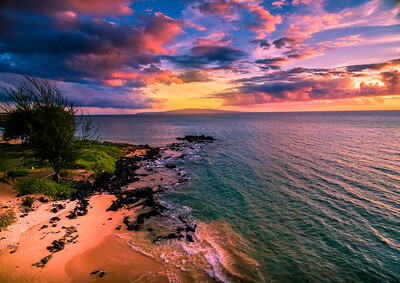 It is a very spiritual place to relax and view some spectacular sunsets.